Primary cardiac tumor is a rare disease with an incidence ranging from 0.001 to 0.3%, and 75% of cardiac tumors are benign [1, 2]. Atrial myxoma is the commonest type [3, 4, 5], which accounts for more than half of the benign cardiac tumors. Echocardiography is the most valuable diagnostic imaging technique . Surgical resection is the main treatment of cardiac myxoma and should be performed as early as possible when diagnosis is established because of risks of embolization and valvular obstruction [7, 8, 9]. The prognosis of cardiac myxoma is favorable after complete resection. Median sternotomy is the conventional approach for resection of cardiac tumors, but it accompanies with unsatisfied cosmetic outcome, risk of sternal infection and other possible complications. 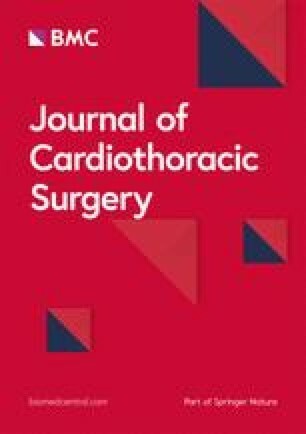 With the advancements of minimally invasive techniques in valve surgery, right anterolateral minithoracotomy incision is now gradually applied in the surgery of cardiac tumors; however, there are very few reports with limited cases [10, 11, 12]. In this retrospective study, we summarized our own experience using these two surgical incisions and aimed to provide alternative options for the treatment of cardiac tumors. Video assisted and totally thoracoscopic surgical resection of left atrial myxoma had been reported in recent years [25, 26, 27]. These literatures proved the feasibility of thoracoscopic surgery in such disease, and yielded excellent outcomes. From these studies, the average cross clamp time was around 50 min and cardiopulmonary bypass time was around 120 min, which are acceptable, but still longer than the results of sternotomy or minithoracotomy. We also started using video assisted technique in very recent years, and one patient in this study underwent video assisted surgery uneventfully, and her incision was only around 4 cm.